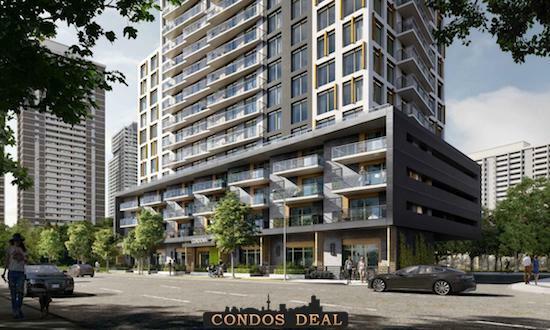 12 Cordova Condos is a new condo project by Minto Group and is currently in pre-construction. 12 Cordova architect is designed by Radael + Bigauskas Architects. The new project will be located at 12 Cordova Avenue in Etobicoke. The major intersection is Islington Avenue & Dundas Street West. 12 Cordova Avenue Condos will have a 23 storey tower built on top of a 4 storey podium with 327 mixed units. Units will be a mix of 59 one bedroom, 105 one bedroom plus den, 108 two bedroom, 23 two bedroom plus den and 32 three bedroom. The estimated completion date for 12 Cordova Condos is still unknown. 12 Cordova Condos will feature over 5,300 sqft of indoor amenity apace and over 5,500 sqft of outdoor amenity space on the ground level. The building will include below grade parking garage of a total of 251 parking spaces. There will be 5 underground levels which will include 218 resident parking spaces and 33 visitor parking spaces. The building will also have 245 bicycle spaces which will include 222 resident bicycle spaces and 23 visitors bicycle spaces. Other projects by Minto are Glen Agar Homes, Berkshire Abbey Towns at Kingmeadow, Oakvillage Towns Phase 1, 30 Roe Condos by Minto, 94 CUMBERLAND CONDOS, 578 FRONT ST CONDOS, Minto Westside Condos, Minto Yorkville Condos and Bside Condos.